Silverside was captain of the crew Elysium but no longer sails the oceans. 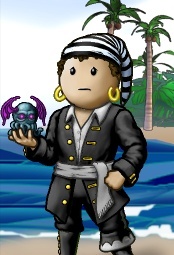 Shortly after joining Sage, Silverside joined Devil's Crew as his first crew and became close friends with Amylo. After some time, he retired. When he came back, he left Devil's Crew and joined The Lost Lot. Silverside learnt Batte Navigation under Teal during the time he was in the crew. After learning from Teal, he led elite pillages on his own in the Osprey Archipelago, along the route of Ambush Island and Mirage Island. He also bought an estate on Caravanserai Island with his hearty, Sy. Soon after reaching the rank of senior officer in The Lost lot, he retired again. He left The Lost Lot on March 30th 2007 without any notice or reason. Silverside could then be seen in his new found crew Elysium created on April 3. Until a date unknown Silverside still longed for a familiar of his own, but had no actual luck in finding one. This page was last modified on 10 November 2009, at 15:44.